Complete accessory pack for your SoakerHose Irrigation Pipe. The Handy Connector Accessory Pack contains a special selection of the most popular connectors which will enable you to cut and join and fit the hose to your gardens needs. Go round corners or split into several runs with T pieces. 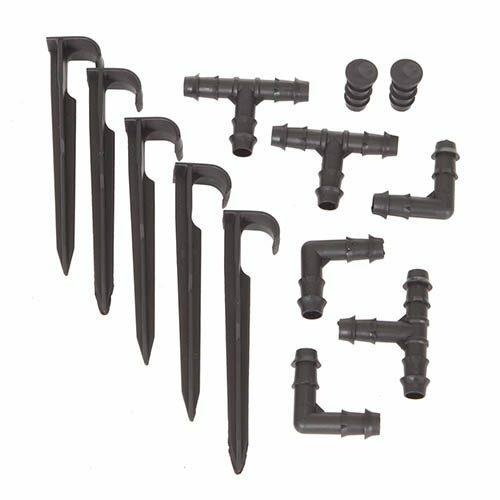 Pack includes; 5 x stakes to pin to the soil, 3 x 90 degree corner elbows, 3 x ‘T’ pieces and 2 x end stoppers (one is also included with the hose). The Handy Connector Accessory Pack contains a special selection of the most popular connectors which will enable you to cut and join and fit the hose to your gardens needs. Go round corners, split into several runs with T pieces. 5 x Stakes to pin to the soil - we suggest 1 every 5M or so.